Emil, born in Paris, France, moved to Los Angeles, California in 1928. Emil taught painting in Laguna Beach and had many friends in the art scene there. Emil was also a special effects artist for 20th Century Fox Studios. The buried Statue of Liberty seen at the beach in the finale of Planet of the Apes is a matte painting done by Emil, as well as the original 20th Century-Fox “searchlight” logo, beyond those notable achievements, he won a 1963 Oscar for his work on Cleopatra. In his art, Emil typically used pencil and oil, but his most widely-known works are his watercolors. Emil’s watercolor paintings burst with bold use of color. In addition to Emil’s appreciation for California’s untouched sensual landscape, Emil’s work included environmental concerns. 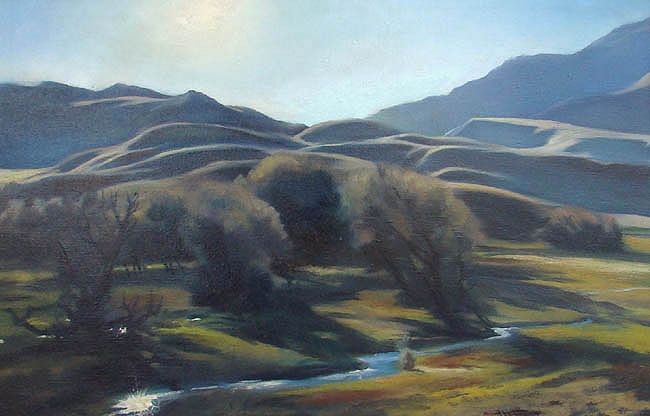 Emil’s paintings display a variety of country and cityscapes around southern California. “Winter Sun” is currently for sale at William A. Karges Fine Art. I recently learned that the iconic Statue of Liberty scene from Planet of the Apes was actually a matte painting by Emil Kosa Jr. Does anyone know where the painting is now or if it even still exists? Thanks for any information. re: your twit about Scaroni’s canyon. It was part of the original Scaroni Ranch; the property went from the tide line to the top of the ridge. The Scaronis were dairy farmers, and the family planted apples in the wind-protected mouth of the canyon just off the Coast Road. Back in the 60’s they were still there, about 50-60 years old. There was a ranch road that ran up the canyon, overhung with trees; and ferny dells on the canyon floor. A fairytale spot it was, as different from the windswept headlands pastures across the road, as night from day. « Josef Hoflehner’s silver gelatin California 1.